If you blog on WordPress, you are familiar with the annual report WordPress.com sends out at the end of the calendar year. The report gives you a nice snapshot of what you did with your blog over the course of the year. Looking at my 2012 WordPress stats and those on Google Analytics, I am amazed at how much this blog has grown over just one year. My pageviews grew over 241% from 2011. A lot of the growth, I believe, has to do with consistency, – I blogged 248 times in 2012 – the power of social media, and commenting on other blogs. 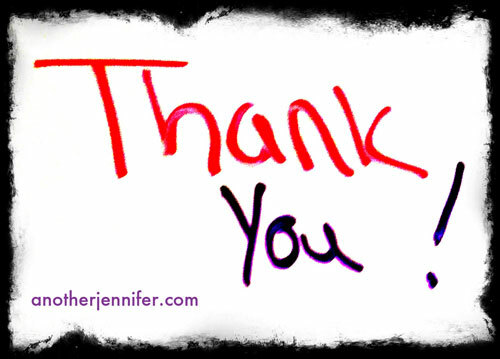 Since it is National Thank You month, I wanted to take the time to thank you, my readers, for sticking with this blog. I especially want to give a big shout out to my top 5 commenters on another jennifer for 2012. I read all of these amazing women’s blogs on a regular basis and encourage you to do so as well. And since nobody gets handwritten letters anymore, I thought I would honor National Thank You Month by offering real thank you notes to my readers. Seriously. Just leave me your address in a comment or via email, and I’ll send you a real handwritten note. One that I will actually take the time to write with a pen. I have some cool notecards I can use, and I’ll even throw in an another jennifer magnet and sticker. Because, you know what? Taking the time to show your appreciation is also a simple way to give back. Who will you thank this month? Your comment makes me so happy, Leah! Thanks for your kinds words. That’s exactly why I think we should say thank you (and mean it) more. I hope you go out and thank someone – or take the time to hand write a thank you note – and let them know they’ve made a difference to you. So, I get an awesome thank you card, an awesome magnet and your real life autograph? I’m in! That is really great Jennifer! You have a great product here, so it’s no wonder you are doing so well! And yes, Chris is one of the best, most dedicated readers/commenters out there!!! Thanks, Alexa. I appreciate your kinds words. Looking forward to connecting more through our blogs in 2013! And, yes, Chris is pretty great! AW!!!!!! I am SOOOOO grateful for your sweetness Alexa!! And you too, Jennifer! But really, how can you read such great work and not respond and support that beautiful person behind the writing? How I say? Just can’t with you BOTH. ~ Jennifer…I couldn’t be more happy for you and all your hard work has paid off!!! You are an inspiration to so many and I love to follow you. I am so glad and so grateful for our new friendship! And this shout out…? WOW! SO kind. 🙂 I am so TOTALLY gonna frame my autographed thank you note! Haha! I am honored, Chris. 🙂 I’ll be sending the note out tomorrow! I always enjoy your posts, Jenn. Now that you’re nice and settled, I’m sure you’ll be more consistent. 🙂 Tell Casey he needs to write a few too! I can’t wait to check out some of these blogs. I only know Michelle’s well and just adore her. This is a great way to say thank you – I am grateful for my blog community too! Ah, yes. And all because of you and Amy! I get compliments on it all the time. Thank YOU! No surprises about your blog taking off Jennifer, it’s terrific! Appreciate seeing my name listed with the other ladies and I might add I too appreciate your support over at my place. It was cool to see how many comments you all made on the blog. Makes me feel loved. And I look forward to more posts from both your blogs! Aww, that is so sweet! I didn’t realize it was thank you month and handwritten notes is a cool way to do it! I’ve got a self-hosted WP blog and don’t get one of those reports (unless maybe it’s in the Jetpack plugin) but I think it is a great tool. Stopping by from Sharefest and hope you have a great weekend. c @ annuary chit recently posted..PicMonkey’s Premium: Is Royale too high for you? Mine is self-hosted too. I got the report via Jetpack. It’s a pretty neat report, though it’s a little off from my Google Analytics stats. What a fantastic thing to do! 🙂 There is nothing more validating as a blogger than knowing your word matter to someone else. Good for you! It’s so true. I love that my words might cheer someone up or help them out. I know other blogs do the same for me.